Last December, twenty nuns in the Tibetan Buddhist tradition became the ﬁrst in Tibetan history to earn the prestigious Geshe degree, comparable to a PhD in Buddhist Philosophy. Chopa Tenzin Lhadron is one of those nuns. She was born into a semi-nomad family in the Zanskar Valley of Ladakh, a culture that did not expect its girls to learn to read. 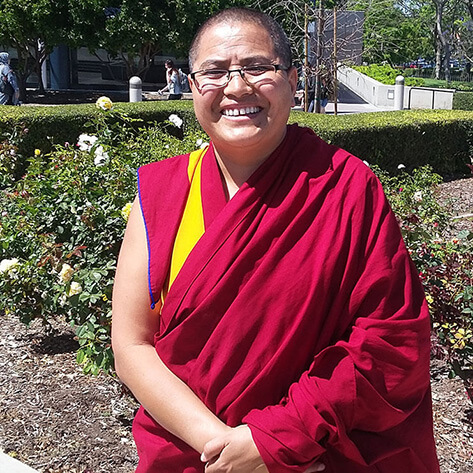 Through ardent determination, ripening karma, and strong support, however, Geshe-ma realized her educational dreams. She has a personal interest in participating in the dialogue begun by His Holiness about science and spirituality. She would also like to explore teaching secular ethics, promoting human values like compassion, loving-kindness, and patience to be practised within families around the world.